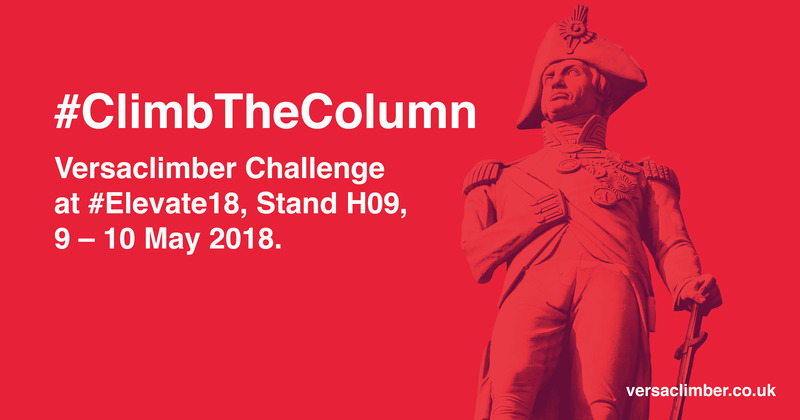 To celebrate the arrival of Elevate 2018, taking place between 9 – 10 May at London’s ExCeL, Versaclimber UK is inviting visitors to take part in a challenge to climb the height of Nelson’s Column on one of our machines. A staple of London’s Trafalgar Square since 1843, Nelson’s Column stands 52m tall and commemorates war hero, Admiral Horatio Nelson. Since construction, the monument has stood as the centerpiece for the capital’s most televised attractions, including the screening of the 2012 London Paralympics and film premiere’s including the epic finale of blockbuster, Harry Potter. Fancy yourself as the next master of the column? Head on over to stand H09 during your visit to Elevate and test your stamina on the most effective workout machine possible, the Versaclimber. Participants who complete the challenge will be entered into a prize draw, and as the exhibition draws to a close, we’ll announce five lucky winners on our Facebook and Twitter channels. Each will receive a free day pass to London boutique gym, BXR, to try its ‘Climb to the Beat’ class, which recently celebrated its first birthday. London’s Sweat by BXR, which plays host to Europe’s first ever Versaclimber group climbing classes, offers a range of cardio sessions for all levels and abilities. If you’re attending the event, why not take some time out of your day to scale the height of a historical monument? Now that’s something to check off your to-do list. We wish all challengers the best of luck with their climbing endeavour and be sure to share your Elevate experience over on our social media channels, Facebook, Twitter and Instagram using the hashtag #ClimbTheColumn. Feeling adventurous? Take on the challenge at home or in your local gym and share your results on our social media channels. Good luck.